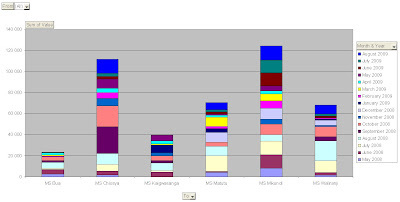 In Mchnji, the sales (in Mk) for each shops are beside (Click to enlarge). Mikundi shop is the best one, followed by Chiosya. The cumulative sales of the 6 shops evolution is described by the graph below. At the beginning, a lot of repairs are done on the water points (see also Area Mechanic work page http://pumpsmaintenancemalawi.blogspot.com/2009/09/mhinji-area-mechanic-work.html). Once the project is stable, the sales move according to business season, dry season and also when shallow wells start to dry (then people start to repair drilled ones).